Lombard Street is about a twenty minute walk away from our hostel, close to the North Beach area of San Francisco. 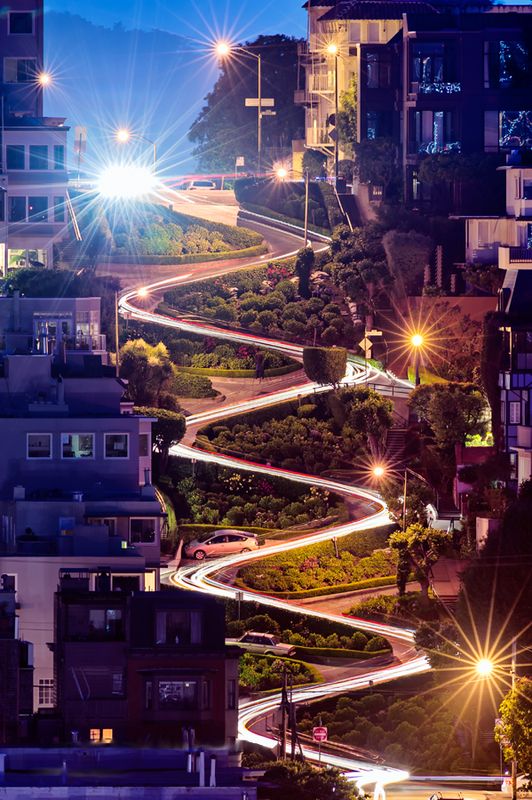 It's famous for being the 'crookedest street,' and has a one block section with eight hairpin turns. It's a nice walk to get up there - you can even take in Chinatown along the way, and busy Columbus Street with the amazing City Lights bookstore. Bear in mind that the section of the street leading up to the crookedest section is made up of pretty steep hills, so you'll need some energy! But the view at the top is worth it - cars queue up for blocks just to drive down the famous section and tourists gather on the other side of the hill, waiting to take pictures of their descent. If you still have the energy after that climb, you can walk back down Lombard Street to the Coit Tower for great panoramic views of San Francisco.